The first of our three qualifying heats drew enough participants for two concurrent races. 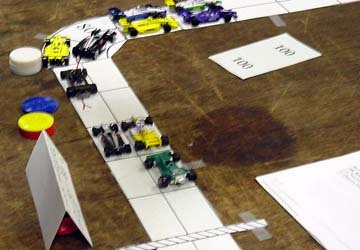 One group raced the French Grand Prix at Vitesse Jean-Behra. The other raced the South African Grand Prix at Kyalami. the race. Lane Newbury made an even bigger late rush coming from seventh on the grid to finish second. 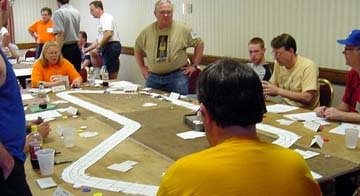 Kevin Keller and the younger Jim Fleckenstein both managed to more or less hold their positions off the grid to finish third and fourth respectfully. On Kyalami, Terry Schulz won the pole with a bid of ten wear and managed to hold onto fourth through the course of the race. The fourth row was the lucky row this time. Lance Ribeiro made the big move and finished first. Row-mate, Derek Landel took third. Dan McGowan managed to hold his second row start position to finish second. Jeff Cornett also held his third row start position to finish fifth. The second qualifying heat drew 11 drivers to the Portuguese Grand Prix of Estoril. Chris Hancock out-bid the field with ten wear for the pole, but did not finish the race. The back of the pack ruled this heat. Scott Cornett came from the last spot on the grid to win. Daren Morley moved up from the eighth spot to grab second place. Gerald Lientz moved up from tenth on the grid to finish third. Jim Fleckenstein the younger moved up from ninth to round out the top four. The final qualifying heat drew the most participants of any heat this weekend. Eleven drivers took to the fast and wide Monza while 11 more spent the afternoon on the narrow, twisting Hungaroring. The Hungarian Grand Prix saw low bidding again. Doug Schulz gained the pole with a 6 bid but still needed some help at the end to become the only pole sitter to win a race the entire weekend. Terry Schulz made the more traditional move this weekend, up from ninth on the grid to finish 2nd. Don Tatum moved up from sixth to grab third. Stephen Munchak made a rush from the last spot on the grid to finish fourth. Earlier qualifying heat winners Scott Cornett and Lance Ribeiro had a chance to finish 1-2 but took each other out in the last corner of the race. The final qualifying race of the weekend ran on the wide-open Italian Grand Prix at Monza. Very low wear bidding saw Chris Hancock grab the pole with a 5 bid, but he would crash later as the last of five drivers that failed to finish the race. John Setear won this heat from the 9th spot on the grid. Gerald Lientz held his fourth position on the grid to finish second. Jason O'Donnell and Dennis Nicholson moved up five positions to finish third and fifth respectively. Joseph Betz held his fifth spot on the grid to finish fourth. The finals once again pitted the drivers against the grueling Schenley Park Grand Prix. After a modified wear bid, Doug Schulz held the pole. However, Doug fell back into the pack on the long opening straight and ended the race 12th on a day when only two of 14 cars crashed out of the race. Terry Schulz opened the race on the inside of row 2 and quickly sprinted to the lead. Terry spent the majority of the race trying to run away and hide from the field. He largely succeeded until he spun in the first corner of the Serpentine on the last lap allowing Jeff Cornett to complete an incredible run from last on the starting grid to 1st. Scott Cornett then passed both Terry and his father in the same corner. Jason O'Donnell recovered from his own spin entering the Serpentine to pull even with Terry for third. Scott exits the Serpentine ahead of his father and enters the final corner of the race in position for the win. Jeff enters the last corner of the race settling for second. out-accelerates Jason heading into the final corner to gain the racing line forcing Jason outside in the corner. Lance Ribeiro pulls into the corner just behind Jason. Scott crossed the line first, having started the race 4th on the grid. Jeff finishes second. Terry exits the final corner of the race on the inside of the track with Jason right next to him. Lance and Dan McGowan lurk behind them. 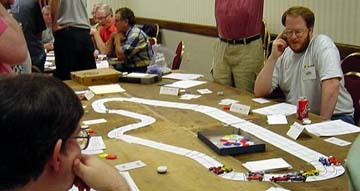 Jason initially wins the drag race for third, but loses control of his car in the process and spins off the track as he crosses the line allowing Terry to cross the line in third. Also finishing ahead of Jason are Lance in fourth and Dan in fifth. Congratulations to everyone on another exciting weekend of racing! See you all next year.